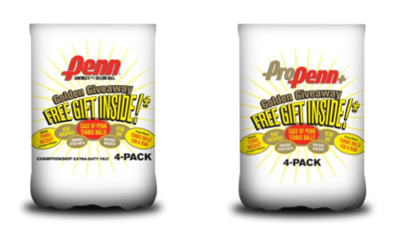 PHOENIX — For a limited time this summer, specially marked 4-packs of Penn Championship and Pro Penn+ tennis balls will include free gifts as part of Penn’s Golden Giveaway promotion. Included in the pack are free gifts ranging from a carabiner sport watch to a HEAD performance tennis racquet to free Penn tennis balls for a year! Once again, Penn offers consumers more than just tennis balls, further differentiating America’s #1 selling ball from other products on the shelf. Special white pack graphics alert consumers to the Golden Giveaway promotion and the gifts found inside each pack. Some gifts are presented in the form of a redeemable coupon due to size. Product will be available beginning in June at major sporting goods retailers and pro/specialty shops nationwide. Sample graphics are shown below.